A black powder charge is the most common and reliable method of ejecting a parachute from your rocket. In your rocket, the motor’s ejection charge will ignite and generate hot gases that pressurize the rocket’s airframe and exert a net force on the bulkplate of the nose cone. This net force will eject the nose cone, shock cord, and parachute out of the rocket airframe. This all happens because the rocket is obeying the Ideal Gas Law. The Ideal Gas Law is the equation of state for a hypothetical “ideal” gas. The state of an amount of gas is determined by its pressure, volume, and temperature. The modern form of this equation is where P is the absolute pressure of the gas, V is the volume occupied by the gas, N is the amount of substance (in this case the substance is black powder), R is the gas constant, and T is the absolute temperature. The equation can be reordered to solve for N directly and known values substituted. The design pressure is determined by the desired net force on a surface divided by the area of that surface. Typical net force values for a 4 inch diameter rocket range from 100 lbf – 200 lbf. This translates to a typical pressure range of 8psi – 16psi. Also, black powder charge amounts are typically reported in the unit grams. Recall there are 454 grams in 1 pound. 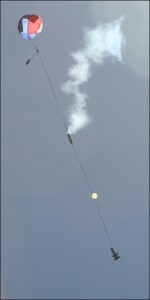 Typically, rocket builders use a charge cup or well to contain the measured amount of black powder for the ejection charges. Everything from PVC end caps, brass pipe fittings, to a rolled length of blue masking tape can be used. Some fixed volume charge cups will require a filler of some type to occupy the empty volume in the cup once the black powder and e-match have been installed. Rocket builders typically use soft foam ear plugs or shredded housing insulation material more commonly called “dog barf”. Cannon Plug covers, electrical tape, masking tape, duct tape, and even hot glue can be used to seal the charge cups. Instructions: Enter the dimensions (in inches) of your parachute compartment. Measure from the back bulkplate all the way to the front of the tube. Once you have calculated the ejection charge sizes for your rocket, ground test those charge sizes several time before you fly. Tip: Avoid drag separation and inertial separation of your rocket parts in flight by adding shear pins to your recovery systems. Drag separation occurs when the difference in drag between your booster and the rest of the rocket is great enough to pull them apart in flight. It can have some pretty nasty consequences. Inertial separation occurs on dual deployment rockets and is when the apogee separation event imparts enough momentum to the separating parts that the inertial of the “snap back” also deploys the main parachute. Then you have to wait a lot longer that you expected to get your rocket down. You can use #2 and #4 plastic screws as shear pins. If used correctly, the pins keep the parts together in flight and then shear when the ejection charges go off. A #2 shear pin shears at 25lbs, and a #4 shear pin shears at 40lbs. The total shear strength of all pins in a joint should not exceed your designed ejection force. That is why the calculator also calculates your bulkhead force. Hey, do you know if there’s any article related to this subject? Or even a book? ?